Spectrum Telecoms is one of the UK’s fastest growing telecoms providers. As our Business Partner, your customers can benefit from the same innovative telecoms solutions, technical expertise and outstanding support that our clients already enjoy. We understand that the business success of our Business Partners relies upon the ability to provide services, solutions and value that fully satisfy their customers’ needs. Our Business Partners enjoy access to the UK’s fastest, most robust and most geographically diverse next-generation optical networks. We provide the widest range of innovative voice and data solutions and hosted services based upon trusted and proven technologies, and give you the flexibility to bundle them as you wish in order to meet the precise needs of your customers in the most cost-effective way. Spectrum Telecoms are proud of the reputation we’ve gained as one of the UK’s most flexible, innovative and service-oriented business communications providers and we know that doing everything we can to help our Business Partners to achieve success is fundamental to our own continued growth and development. When you become a Spectrum Business Partner your business will have access to a full suite of benefits. Customer satisfaction has always been at the heart of Spectrum Telecoms’ business philosophy and it’s something we excel at. Consequently, our customers remain loyal to us and recommend us to other businesses. As a Spectrum Telecoms Business Partner your customers can enjoy that same outstanding customer experience whilst your business reaps the rewards of profitability and customer loyalty. 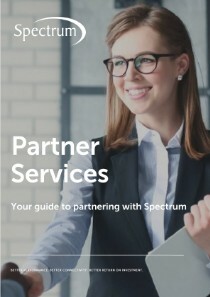 Get in touch for more information on how to become a Spectrum Telecoms Business Partner.